Planning a Euro trip or thinking of running away to Paris? Learn French over your free time on the weekend, and know how to order their baguettes and croissants with ease, ask for directions till the Louvre and say ‘C’est La Vie’ with utmost authenticity! 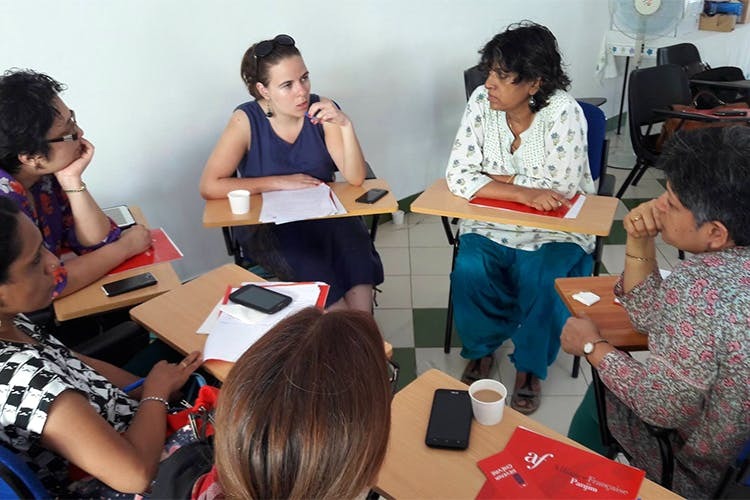 This is the most reputed centre for french language training in India. Their Mumbai centres are in Churchgate, Cuff Parade, Santacruz and Mulund. You work your way up in the core skills of the language – reading, writing, speaking and start from level A1. Furthermore there is A2, B1, B2 and C1, C2. Each centre offers weekend courses for those who are busy during the week, and you can pick your timings for the 2-hour a day class. Class schedules vary and additional information is available on their website. The Cambridge Institute of language studies is located in Andheri, with a branch in Kandivali and Ghatkopar and they teach over 6 European languages, including French. Their courses are two months long, and they offer weekend batches & Saturdays-only batches too. The American Institute of Foreign Languages in Andheri takes French classes for different levels. The total duration of each level, for example A1, is two months although weekend classes may take up to 3 months. A course is for INR 15,000 and students will need to sit for an exam once the course is completed and will receive a certificate of completion. Do contact them for additional details. This language training institute has centres in Navi Mumbai and Ghatkopar too. The courses are divided into levels: beginners, elementary, intermediate and advanced. The aim is to make you proficient in the language you are learning so that you are at ease with it as your second tongue. Mumbai University's French Department offers part-time weekend certificate courses in the language on Saturdays and Sundays. They also have a diploma course over the weekend, an advanced diploma course for more proficient students as well as a diploma course in translation for those looking to make a career in language translation. However courses are subject to availability of teachers and number of students, so call ahead.